A book that some may enjoy, and other's not as much. I just finished Lesley Hazleton's book, and I want to read it again. So much is answered in this narrative of Muhammad's life, but the story raises so many questions. 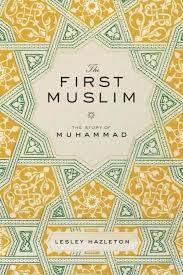 Divided into three parts: Orphan, Exile and Leader, the book traces and documents Muhammad's life. Appropriate questions are raised that try and dispel the natural myths that grow around such a revered figure. By stripping him down to a more personal level, he becomes that much more interesting. Much like the life of Jesus, Moses or Abraham, Hazelton's book tries to sort what singled out these men and enabled the growth of a religious movement. Commitment to the written word -- and the ability of those words to transcend time seems crucial. The book is well-researched and the people in Muhammad's life, from his first wife to his son-in-law are firmly placed around him. Hazelton shows restraint when trying to imagine what these people were like day in and day out and tries to match the time to the possibility. Islam, Muhammad and the believers--Muslims--have been the subject of many inches of copy in the past decade. Hazelton takes us back to the politics, history and needs of the time to set the stage for the birth of a religion. Regardless of faith or perhaps for the human need for it, the book certainly adds to civil discourse, not rhetoric. Leslie Hazelton was a reporter in the Middle East, writing for The New York Times, The New York Review of Books and Harper's. Her last book, After the Prophet was a finalist for a PEN Center USA Literary Award. I am not a political junkie, but I do try to read at least one presidential biography a year. Admittedly, I didn't know much about Lyndon B. Johnson beyond his association with JFK or the Vietnam War. Now, however, having read The Passage of Power, the fourth installment of Robert Caro's much praised series on Johnson, I have a broader appreciation of the nuances of Senate negotiations and why LBJ was referred to as the "Master of the Senate." Before I go on, it's worth noting that to enjoy this book, it isn't essential that the reader has read the previous three volumes. This tome, now available in paperback, spans roughly five years, beginning shortly before the 1960 election, through the Bay of Pigs, the Cuban missile crisis, Kennedy's assassination and the transition to Johnson's presidency. Johnson is complex. Growing up in Texas his family was admired for its leadership and position and then endured a steep fall from grace, stature and wealth. Through it all, Johnson, however proud and awkward, held onto his aspirations to greatness. Caro methodically documents and compellingly narrates why Johnson is a master of the political arena. It is often said he was the "ultimate salesperson," and because of this gift, and his ability to read a man, he knew how to play the individual to get what he wanted out of him. At times this is awesome and other times frightening. It is hard to discern what his motivation was--if there was any beyond power. Certainly, his legacy has been polished due to his master policy-making and the passage of landmark and important acts including the 1964 Civil Rights Act. Indeed, in consideration of today's political stalemate, there just may be some lessons here on how to negotiate a deal. Caro's careful chronicling of events is a master class in history and writing. Winner of two Pulitzer Prizes in Biography; three National Book Critics Circle Awards, for Best Nonfiction Book of the Year and Best Biography; the National Book Award; the Francis Parkman Prize, awarded by the Society of American Historians to the book that best "exemplifies the union of the historian and the artist"; and virtually every other major literary honor including the Gold Medal in Biography from the National Academy of Arts and Letters and the National Humanities Medal, awarded by President Barak Obama. Caro is presently at work on his fifth and final volume of the 36th president. America’s love-hate relationship with the media is not a new phenomenon. The days of scoops and exclusives are long over, the press’s ability to influence a nation has been tarnished by the economic need to get and sell the story. The events, which lay the ground work for today’s media feeding frenzy, are laid out in a fascinating detail, in a book written decades ago by David Halberstam, The Powers That Be. Also feted by his examination of the 1950s, in The Fifties, Halberstam gives context, scope and downright good gossip on the beginnings of today’s journalistic legends including Henry Luce of Time magazine, William Paley of CBS, and the Grahams of The Washington Post and the Chandlers of The Los Angeles Times. Reading the book not only gives the reader insight into the uniquely American combination of business and journalism, but the added spice of politics. Without exception, the titans of these media used their influence and power to bring politicians up –as The Los Angeles Times did with Richard Nixon--and down--in the case of The Washington Post and the very same Mr. Nixon. 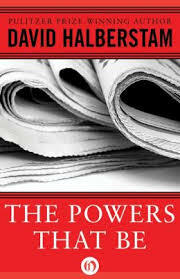 From FDR to Woodward and Bernstein, The Powers That Be is a lesson in history that reads like a Hollywood script. David Halberstam was the author of 11 books including The Best and The Brightest and The Reckoning. He has won every major journalistic award including the Pulitzer Prize.